A potentially good “Getting Seriously Started with the Photography” kit is now available at Adorama for $750 with free expedited shipping. You get the Sony a6000 two lens kit with the 18-55mm and 55-210mm lenses, the Adobe Lightroom 6 software, and a $50 Adorama gift certificate. One could then use the $50 gift certificate to purchase other necessities for new photographers (tripod/monopod/etc). Bundle up time for the E-mount! Adorama is offering a Sony a6000 bundle with the 16-50 and 55-210 lenses and the Adobe Lightroom 6 software (stand-alone, not cloud), all together for $846 with free shipping. If you don’t want/need Lightroom 6, for the same price and same two lenses, you can get free accessories in the black kit (extra Sony batter, extra Sony charger, Sony screen protector, 64GB Lexar SDXC) and in the silver kit (same free accessories). On the other hand, if you are fond of certified refurbished, and don’t need any of the aforementioned bonus items, you can get the Sony a6000 two-lens kit for $680 with free shipping by Secondipity thru Amazon. The page there says this will ship by Ground Transportation, so it will not arrive as fast as Prime items typically arrive. Lightroom has two versions available, one for the iPhone/iPod and for the iPads. With the new bigger and more powerful iPad Pro, things may get more interesting worfklow-wise. More via Apple Insider et al. Stacksocial has another “Pay What You Want” promotion, this time it is a Business Design Bundle that includes ten Adobe Lightroom Presets. To get all items, including the LR Presents you must meet or beat the average price which is currently $2.24. 10% of proceeds go to Creative Commons per the page over there. Lightroom 6 is here and it can be yours in mere minutes. The digital download version for either Windows or Mac is currently available for $150 at Amazon by Amazon itself. The download size is listed as 750MB. The Disc by Mail is in “temporarily out of stock” status. BuyDig has created their own Nikon D750 body only bundle. The D750 body only kit is new condition with USA warranty. The bundle includes the factory refurbished Nikon 50mm f1.8G lens (with 90 day Nikon warranty), the Adobe Lightroom 5 software (PC or Mac), and 64GB generic SD card, for $2300 with free shipping. This offer ends 4/6/15 or earlier if sold out. Click the “view more details” link over there, or locate the “Rebates” tab in the gray bar below. Note that this is not a rebate offer, the free items will be included automatically by BuyDig, they are under the “Promotions & Special Offers” section under Rebates. That area has live links to each of the included freebies so you can examine them more closely. More eBay Deals action, the eBay store of BuyDig (part of Beach Camera) offering new condition Canon MG-6620 printer + free Adobe software bundles for $88 with free shipping. You have a choice of free software, either Lightroom 5 or Photoshop Elements. You also have a choice of black or white printer. You select the software and color combinations under “Color” in the eBay listing (annotated screenshot below). Limit five per customer. Amazon has a new Creative Cloud Promo credit promotion for February 2015. You will receive a $25 Amazon promotional credit by email if you sign up for a 12-month $10/month Creative Cloud Photography plan (Photoshop CC and Lightroom). You need to link your Adobe account (existing or new one) when you purchase this. You get a full refund if you cancel within 30 days. If you cancel after the 30 days, there is a 50% cancellation fee of the remaining commitment. Amazon will send the email with the promotional code by April 7 in 2015. Offer ends 2/28/15. PS: this is like a Netflix subscription. You use it while paying. After you stop paying, you don’t own any of the software downloaded. 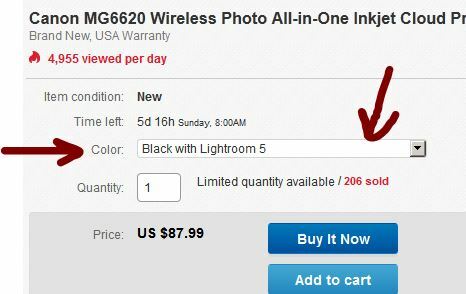 BuyDig.com is offering another Canon Pixma printer and Lightroom 5 bundle, this time brought together by a VISA Checkout coupon. 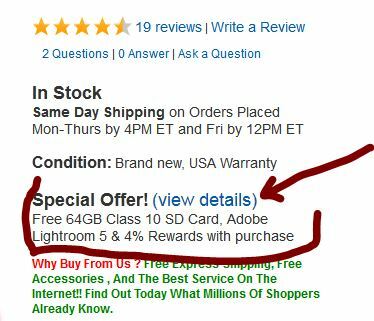 Use Visa Checkout code VMECO at BuyDig to get the Canon MG5620 WiFi All-in-One Printer + Adobe Lightroom 5 for $72 with free shipping. Offer ends by 01/25/15. The Sony RX100 Mark III, along with Adobe’s Lightroom 5, and a 64GB memory card and basic camera pouch is offered for $800 with free shipping and free returns at Groupon Goods. If you are looking to buy the new Canon 7D Mark II and you also need/want Lightroom 5, Buydig is offering it for free as a bundle, along with a 64GB SD card and 4% promotional rewards on both the Canon 7D Mark II body only ($1800) and the 7D Mark II with 18-135mm IS STM ($2150). Offers end by 1/31/15. The free items are included automatically by BuyDig. If you are not familiar with how to spot them, you can find an annotated example in the earlier Canon 6D post. If you like white color printers, BuyDig is offering the Canon PIXMA MG2520 AiO Printer plus Adobe Lightroom 5 together as a bundle for $70 with free shipping. Add to cart to see the price drop from $150 to $70. No coupon needed. A coupon is needed for this next printer and LR5 bundle offer: use coupon code EXCEL to get the Canon PIXMA MG5620 AiO Printer plus Adobe Lightroom 5 for $75 with free shipping. Coupon expires 12/26/14. If you are fond of mail-in rebates, Buydig has a Canon 6D DSLR + 24-105mm f4L IS bundle that includes the Pixma Pro 100 printer, Adobe’s Lightroom 5 software, 50pk of Canon 13×19 inch photo paper, and a camera bag. The price is $2850 on the website. After you add it to the shopping cart, it drops to $2550. After you receive your order, you submit the Canon mail-in rebate (MIR), and a few weeks after that, you receive a $650 prepaid American Express gift card by mail, making it a $1900 after MIR promotion. Promotion expires 12/21/14 or earlier if sold out. BuyDig has another Lightroom 5 plus printer combo. This time it is the Canon PIXMA MG5620 AiO Printer + Adobe Lightroom 5 for $78 with free shipping when you enter coupon code EMKSWIZZY in the shopping cart. You don’t need an account to test the coupon, just add to cart and enter the code. This promotion expires 12/21/14. 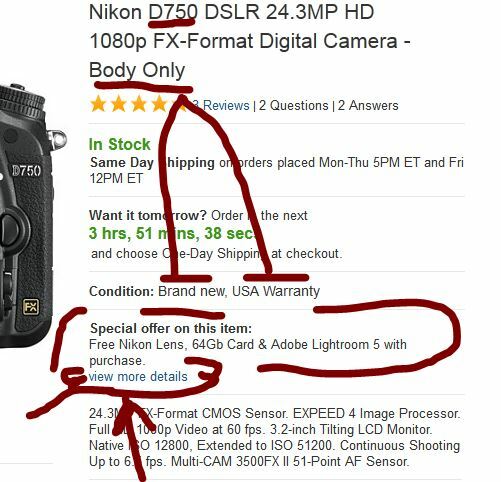 It looks like we have a winner of the Black Friday 2014 “Deal Survivor” “contest”. 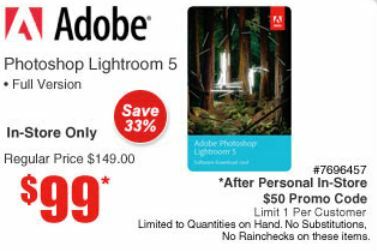 The Adobe Lightroom 5 bundled with the Canon MG-5520 AiO printer for $80 with free shipping is still alive and kicking at BuyDig.com (you have to add it to the shopping cart, the price drops from $150 to $80 after you add to cart). Alternatively, in a similar bundle at BuyDig, you can get Adobe Lightroom 5 bundled with the 2TB Western Digital Portable USB 3.0 Hard Drive for $100 (the price shown in $140, simply add to cart, and it drops to $100).